Several porous chromatographic materials were investigated as synthetic substrates for preparing surrogate nuclear explosion debris particles. Eighteen metals, including some of forensic interest, were loaded onto materials by immersing them in metal solutions (556 mg/L of each metal) to fill the pores, applying gentle heat (110 °C) to drive off water, and then treating them at high temperatures (up to 800 °C) in air to form less soluble metal species. High-boiling-point metals were uniformly loaded on spherical controlled-pore glass to emulate early fallout, whereas low-boiling-point metals were loaded on core–shell silica to represent coated particles formed later in the nuclear fallout-formation process. Analytical studies characterized material balance and the formation of recalcitrant species. Metal loading was 1.5–3 times higher than expected from the pore volume alone, a result attributed to surface coating. Most metals were passively loaded; that is, solutions filled the pores without active metal discrimination. However, niobium and tin concentrations were lower in solutions after pore filling, and were found in elevated concentrations in the final products, indicating selective loading. High-temperature treatments caused reduced solubility of several metals, and the loss of some volatile species (rhenium and tellurium). Sample preparation reproducibility was high (the inter- and intra-batch relative standard deviations were 7.8 and 0.84 %, respectively) indicating suitability for use as a working standard for analytical methods development. 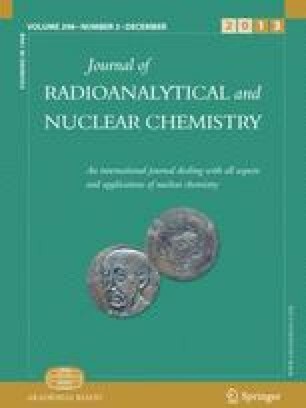 We anticipate future standardized radionuclide-loaded materials will find use in radioanalytical methods development and/or serve as a starting material for the synthesis of more complex nuclear explosion debris forms (e.g., Trinitite). The National Nuclear Security Administration, Office of Nonproliferation and Engineering, NA-22, supported this work under an Interagency Agreement with the U.S. Department of Energy (DOE) under Contract DE-AC05-75RLO1830. The views, opinions, and findings contained within this paper are those of the authors and should not be construed as an official position, policy, or decision of the DOE or NA-22 unless designated by other documentation. The authors wish to thank Tony Kao of Phenomenex for facilitating purchase of bulk Kinetex HELIC core–shell silica and providing Brunauer, Emmett, and Teller characterization data for this material.